Drones may not be taking over the world just yet, but they're clearly the way of the future. Unmanned crafts are playing a greater role in fighting wars and policing cities. Soon they could be shipping you packages and bringing you news. Google (GOOGL) has another purpose for drones (No, not to hand deliver your Gmails). 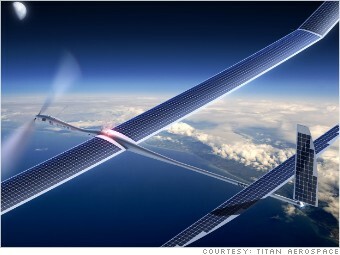 The tech titan wants to deploy drones to help expand Internet coverage to far-flung areas of the globe. Earlier this year, Google made a big splash by agreeing to acquire Titan Aerospace, which makes jet-sized drones that could fly nonstop for years. The dream is that a fleet of these high-altitude, solar-powered drones will beam out Internet signals to millions of people who don't have access to Facebook (FB) and Wikipedia (oh yeah, and Google search ads). While drones may never contribute much to Google's $50 billion in annual revenue, expect the Internet giant to remain at the cutting-edge on this front.